The foramen cecum is a small indentation which is transformed within a foramen through articulation with the ethmoid, where the frontal crest of the frontal bone terminates inferiorly. This foramen differs in size, and is often impermeable; from the nose towards the superior sagittal sinus it conveys the emissary vein, when it is open. 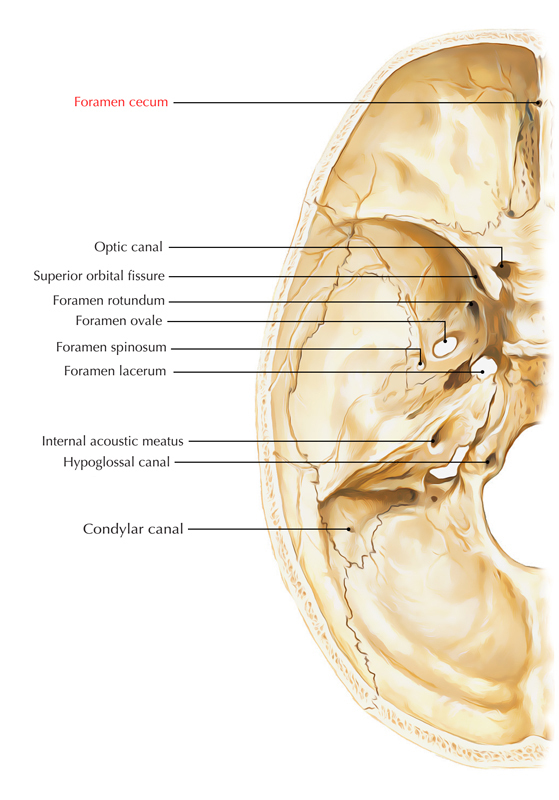 Superior Sagittal Sinus is located in the middle of the two layers of the falx cerebri along the convexity of its connected margin. Behind the foramen cecum, it originates at the crista galli. The anterior cranial fossa exhibits the foramen cecum in the middle of the frontal crest along with crista galli. The anterior median fissure ends inside the foramen cecum. From the nasal mucosa towards the anterior end of the superior sagittal sinus Emissary vein travels through foramen cecum. In some people, an additional nasal vein travels superiorly via the foramen cecum in the frontal bone anterior towards the crista galli, as well as links with the anterior end of the superior sagittal sinus.